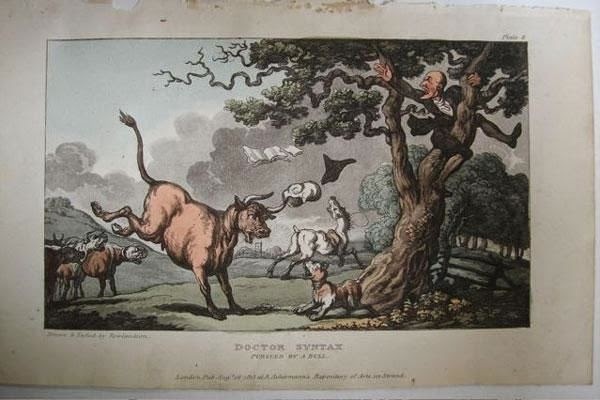 A lot has been written about Doctor Syntax, possibly the first cartoon. Or, perhaps, the first time the word cartoon was used to describe two-dimensional caricatures rather than the preparatory drawings for a formal work. 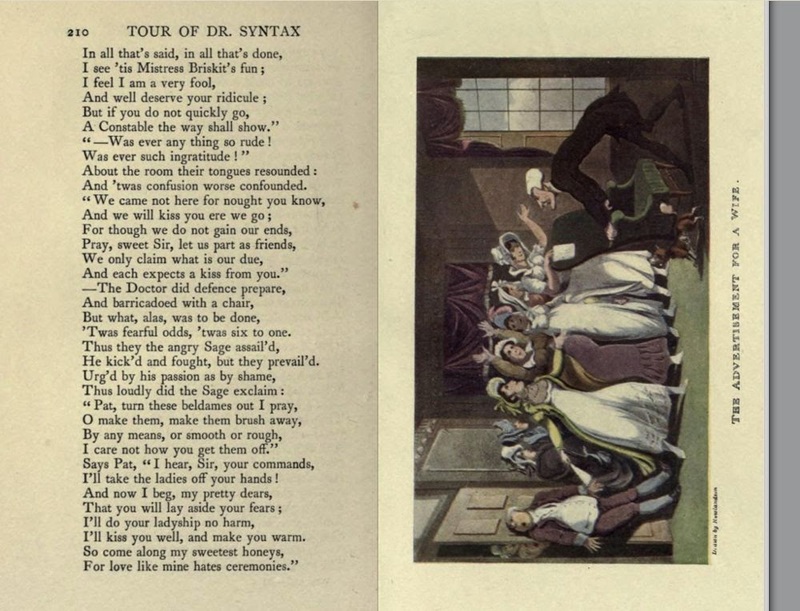 Doctor Syntax was created by the artist Thomas Rowlandson (1756-1827) and put to verse by William Combe (1742-1823). He first appeared in The Poetical Magazine in 1809 (published by Rudolph Ackermann). 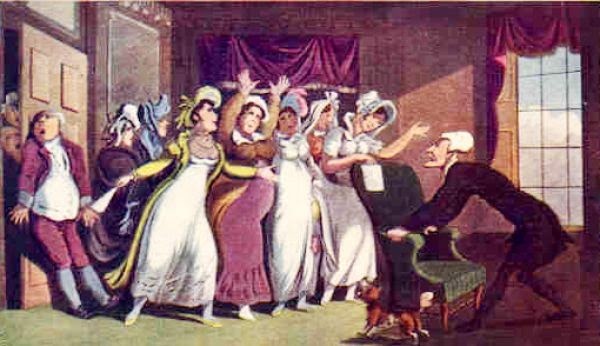 The caricature was so popular that it was published in book form as The Tour of Dr. Syntax in search of the Picturesque in 1812, and was followed by The Second Tour of Dr. Syntax in search of Consolation in 1820 and The Third Tour of Dr. Syntax in search of a Wife in 1821. The books were the best sellers of their day, and continued to be published throughout the 19th century and into the 20th century. 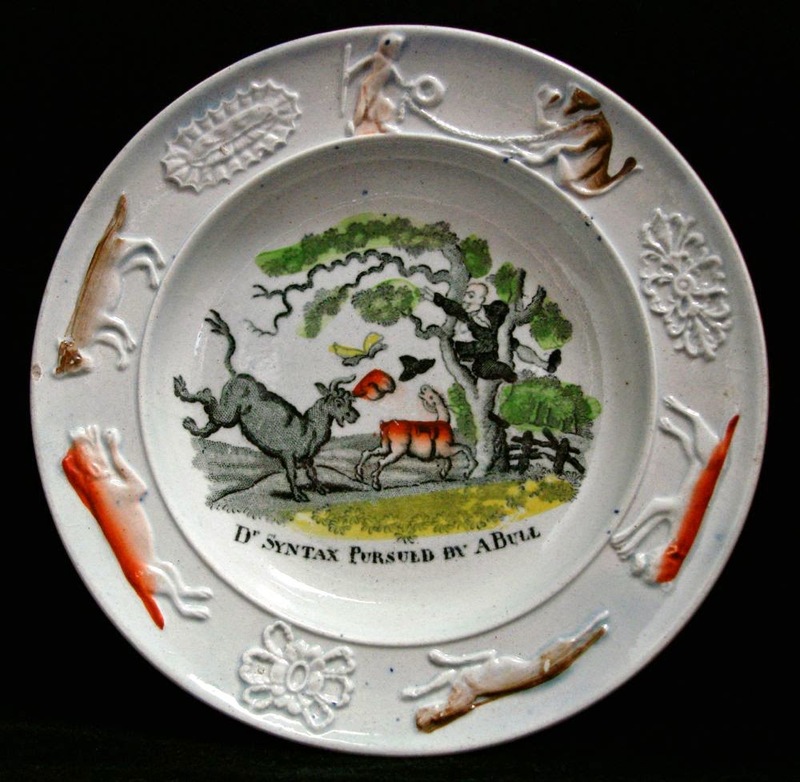 The Staffordshire potters, always looking for what seized the imagination of the public, copied Rowlandson's prints onto pottery. 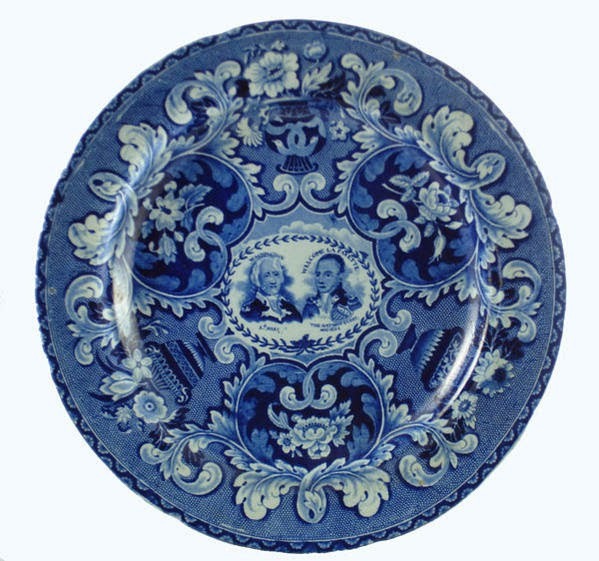 Ralph & James Clews created a dinner service in dark blue (more than 30 different patterns) for the American Market in the 1820s, and the Adams factory sold Doctor Syntax patterned plates from 1900 through the 1970s. 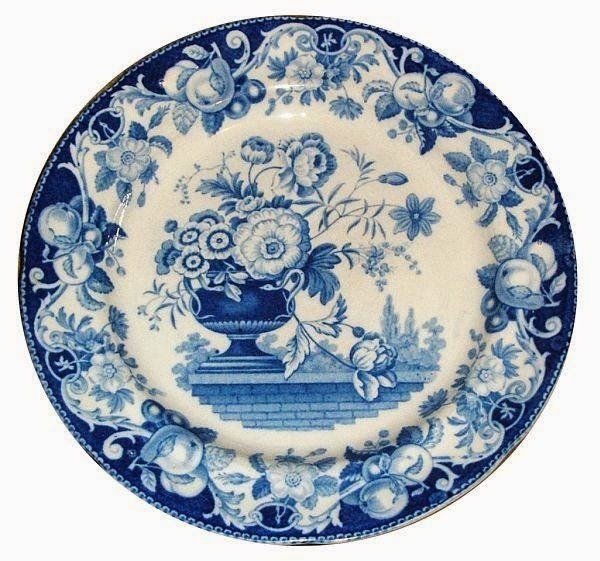 I love the Clews' patterns, but I especially enjoy the Doctor Syntax patterns printed on pottery for children. 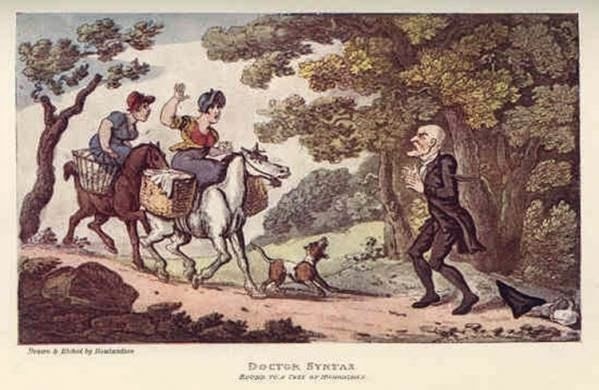 Although Doctor Syntax was intended for adults, he clearly was found amusing by children. I think of him as Bugs Bunny without the ears. 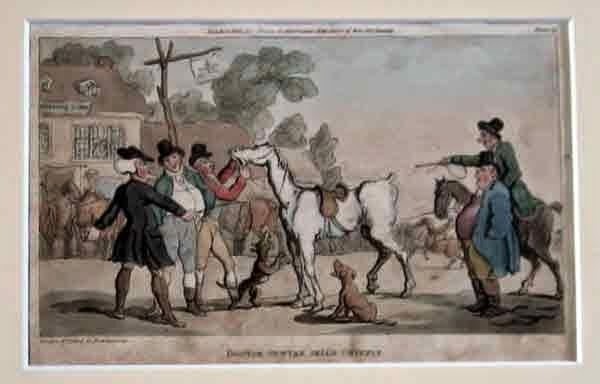 Doctor Syntax Setting Out For London by Thomas Rowlandson/I am not sure which book this print is from. 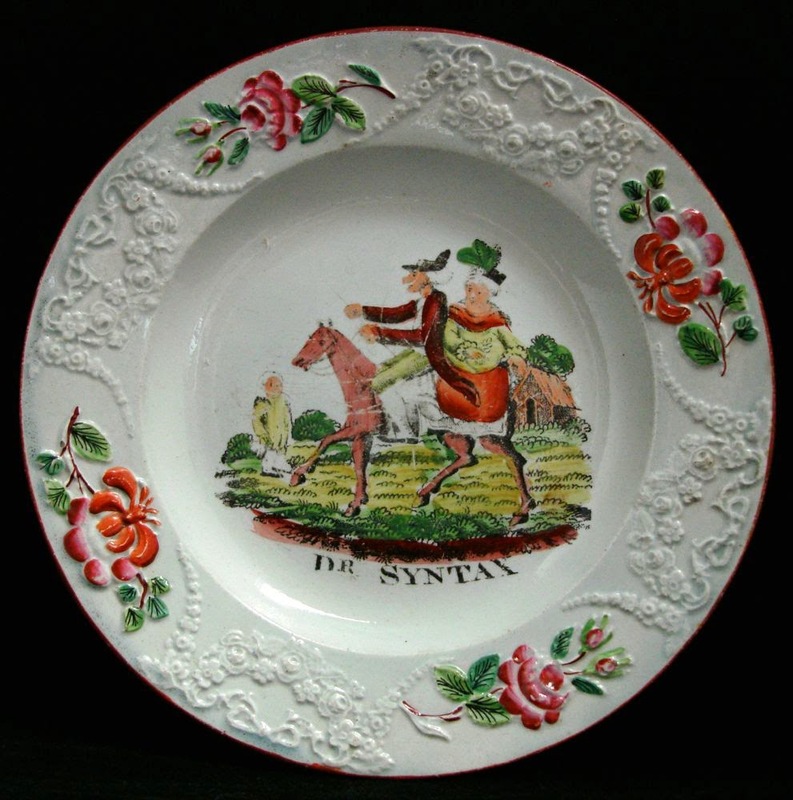 Doctor Syntax was so popular that he appeared in many incarnations. I found a Pinterest page titled Dr. Syntax by Rod Wilson that shows some interesting Doctor Syntax pictures. Take a look. There is even a quilt! If you have made it this far in my blog post, you deserve to see a charming use of a Doctor Syntax cheese cradle. 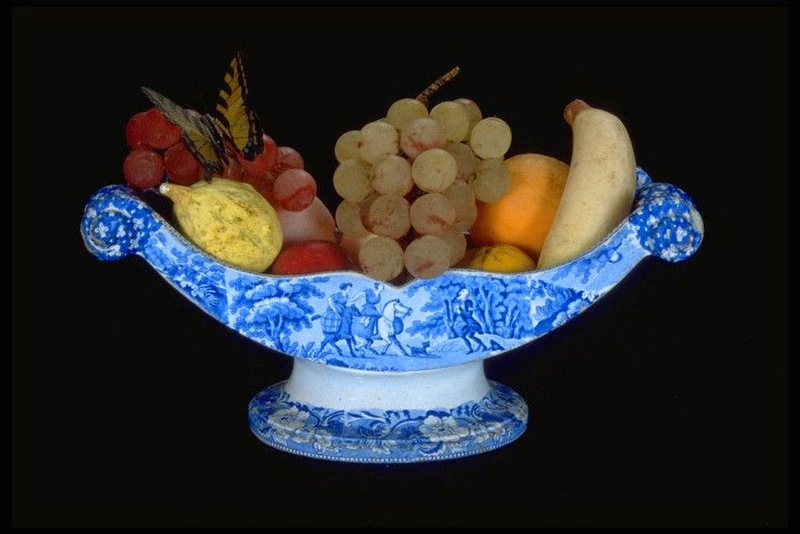 Its original purpose was to hold a stilton cheese wheel, but it has been repurposed here as a fruit stand. The view is Dr. Syntax Bound to a Tree by Highwaymen by Ralph & James Clews. 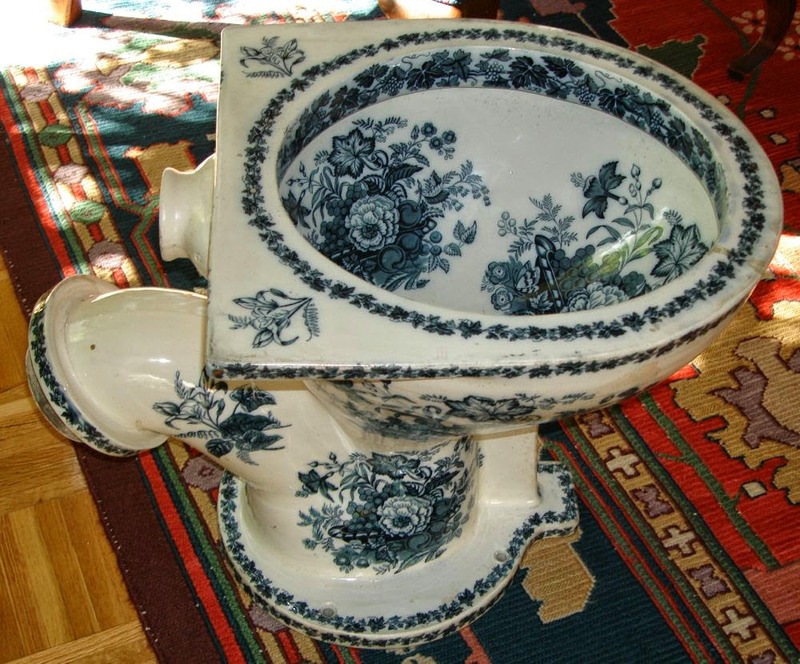 On a trip to Mendocino, California in 1972, I found a molded and painted ceramic toilet I thought would be interesting to use as a plant pot. 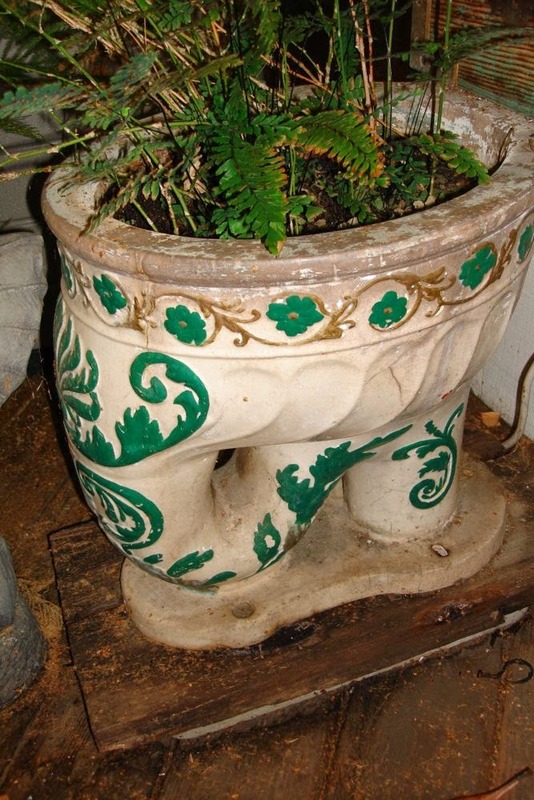 The ferns I planted have survived on benign neglect ever since. 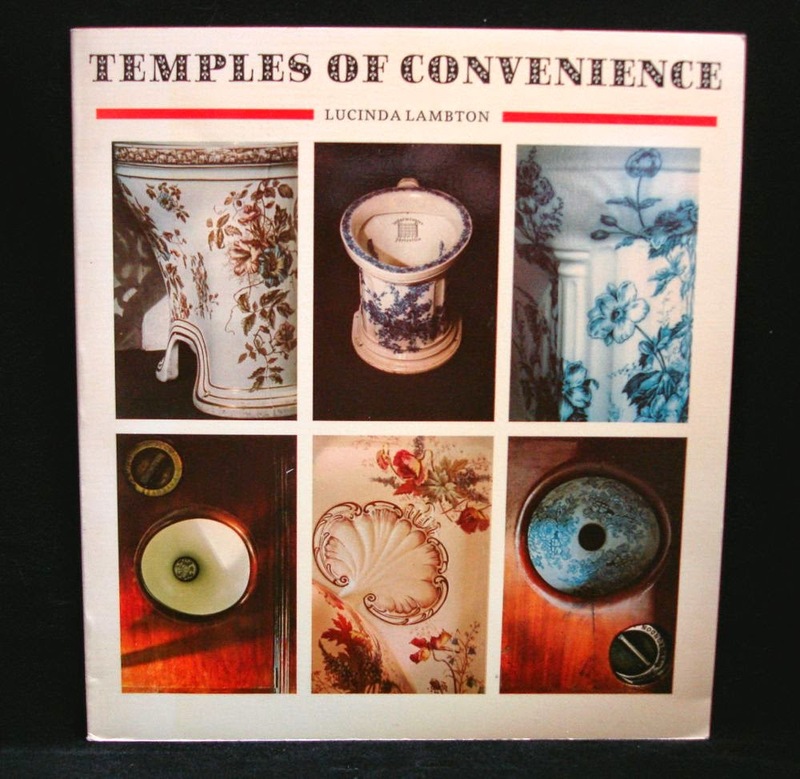 My curiosity about old toilets was sparked, but I didn't learn anything about them until I purchased a book in 1978 titled Temples of Convenience by Lucinda Lambton. 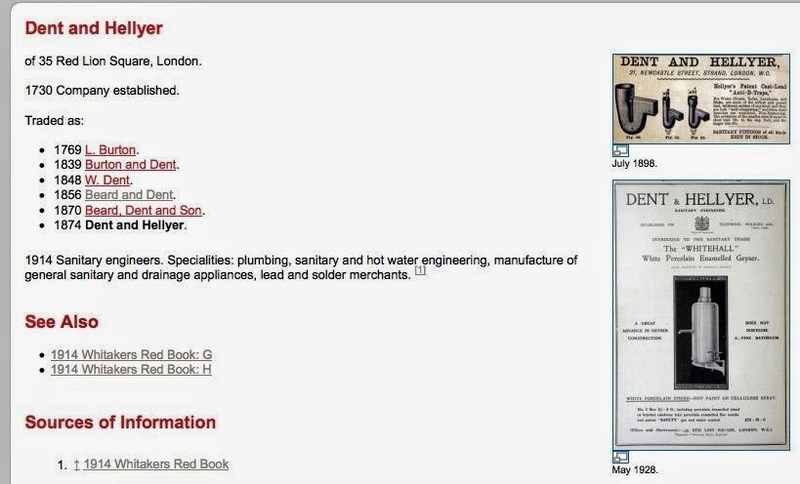 An expanded version of the book, Temples of Convenience: & Chambers of Delight was published in 2002. 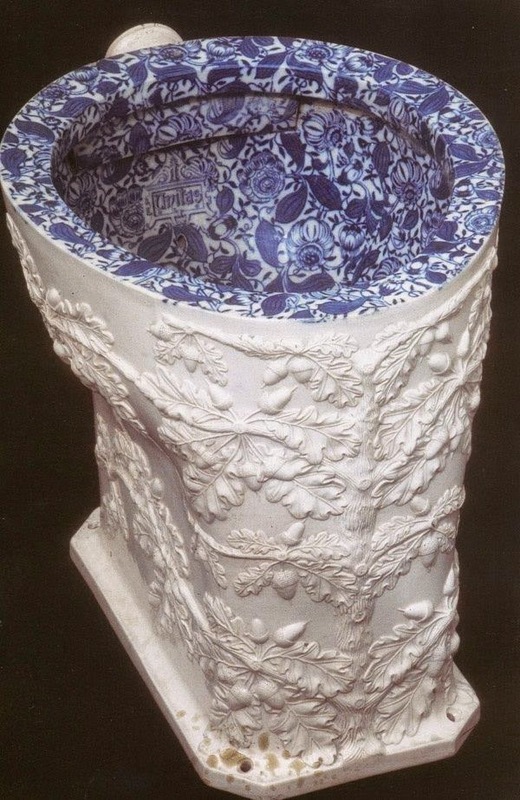 The book features some gorgeous photos of transfer printed toilets, so I hoped I would eventually find one to replace the boring white toilets I had in my house. 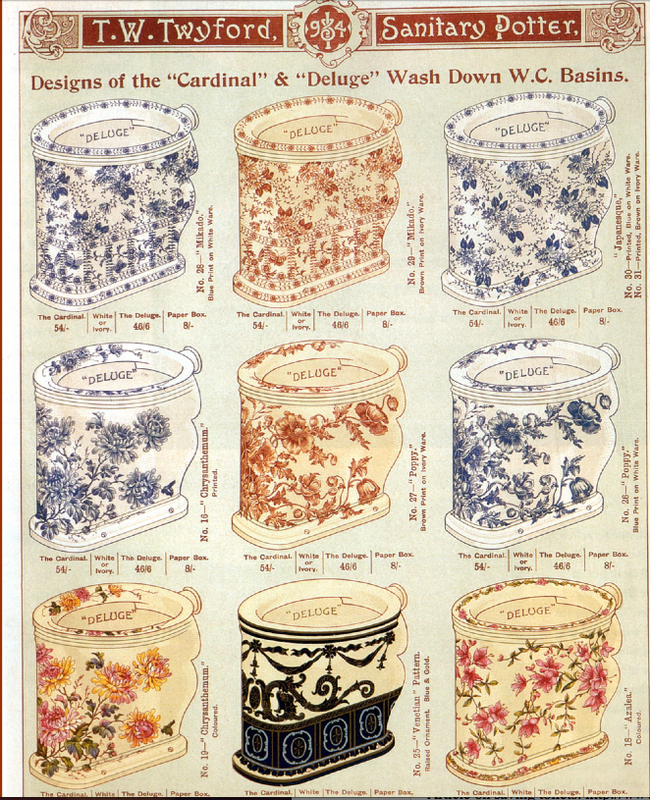 The opportunity didn't arise until late in the 1980s when I spotted a floral printed toilet at a shop in Carmel, California. The owner of the shop assured me that the toilet could be plumbed, but when I got it home it seemed a pity to use in the conventional way. I put it next to my reading chair in the living room. A friend gave me a piece of glass to transform the toilet into a table. 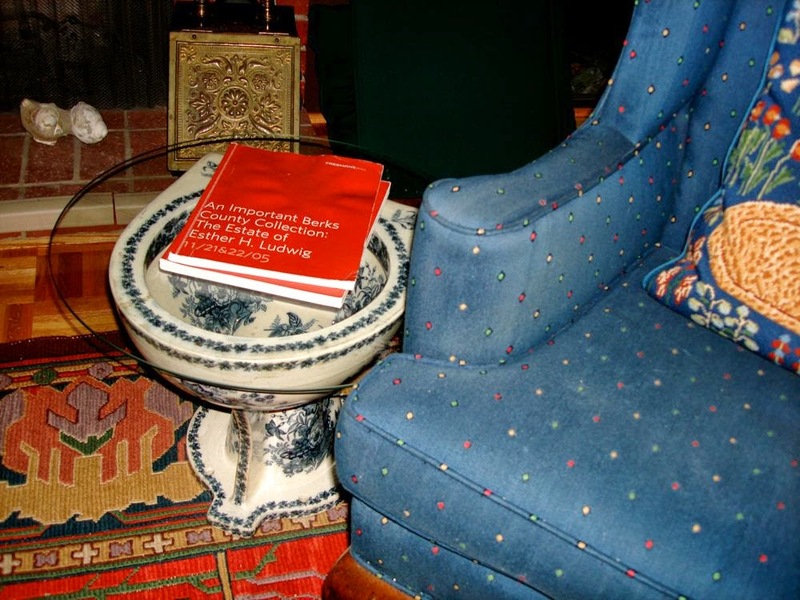 Dent & Hellyer toilet repurposed as a side table! 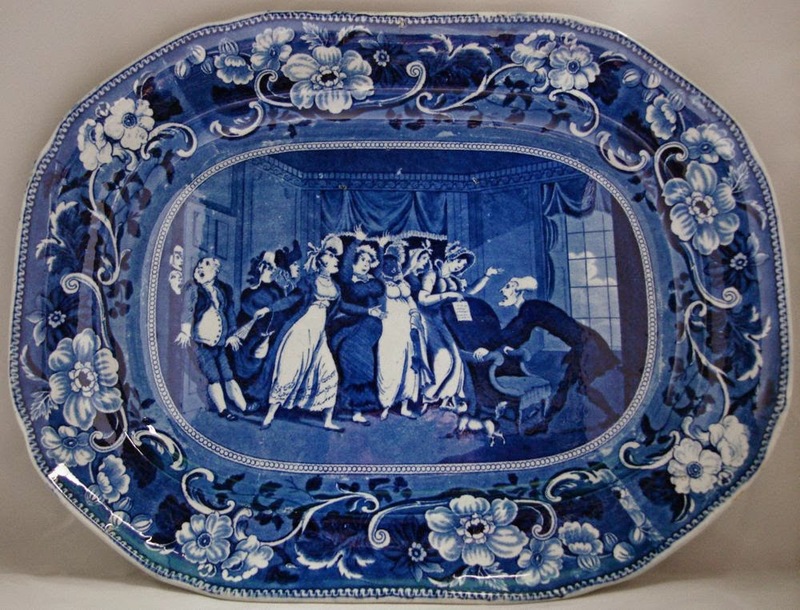 In 2013, the Transferware Collectors Club invited Terry Woolliscroft to give a talk titled The Tale of the Toilet at its annual meeting. Terry's excellent talk transformed the way I thought about the humble toilet. It is not merely a convenience, but a disease inhibitor. My toilet just serves as a side table to hold books (and sometimes a coffee cup). It is also a conversation starter. 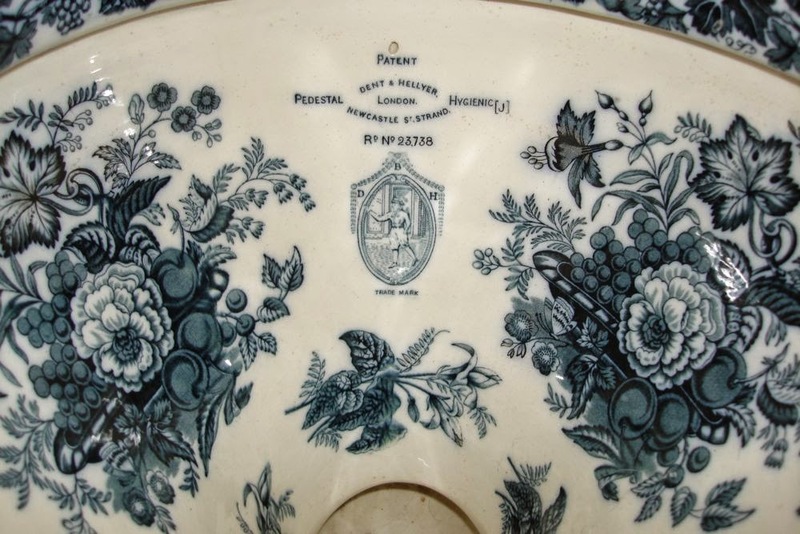 A lovely toilet! An oxymoron? I wrote about July 4 (Independence Day) last year. My grandparents called it Declaration Day. I titled the post Peace and Plenty, but I really wanted to write about my maternal grandfather, Sam Berenson, who told me why he loved America. 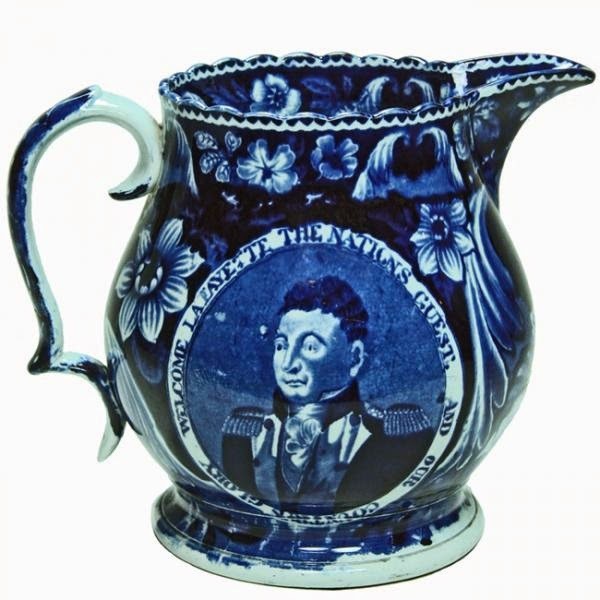 Today I am going to show you some transferware patterns that honored some of the heroes of the Revolutionary War and the War of 1812. 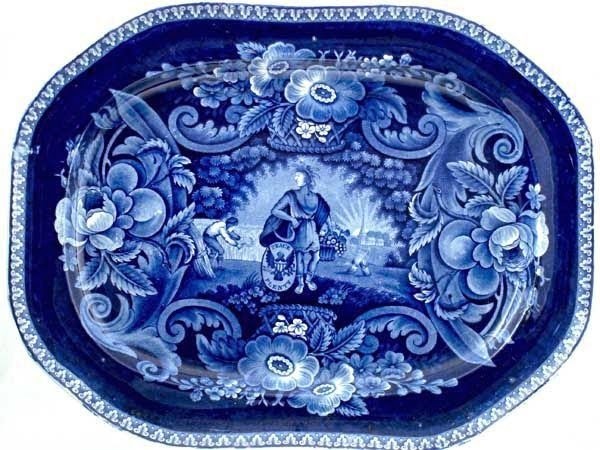 Odd that this pottery was made in British factories shortly after British defeat! I have to assume you all know about the American Revolutionary War (1775-1783) and the War of 1812 (1812-1815). If not, click on the highlighted words that will take you to Wikipedia. 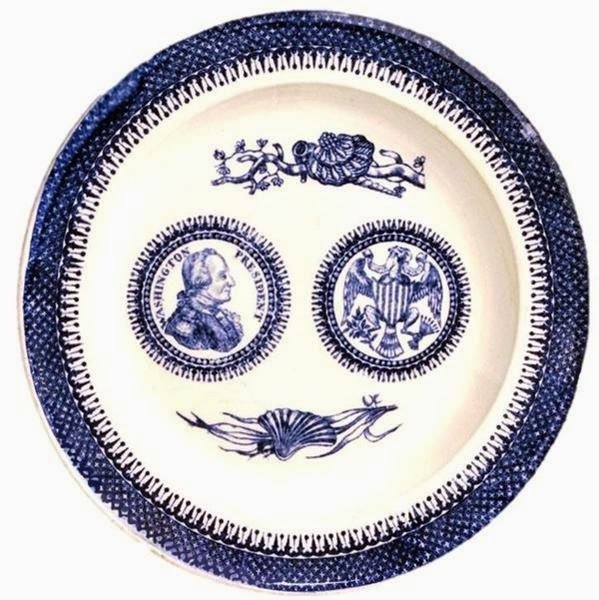 There are lots of patterns that show George Washington and the Marquis de La Fayette (also spelled Lafayette). Sometimes both spellings in the same article! 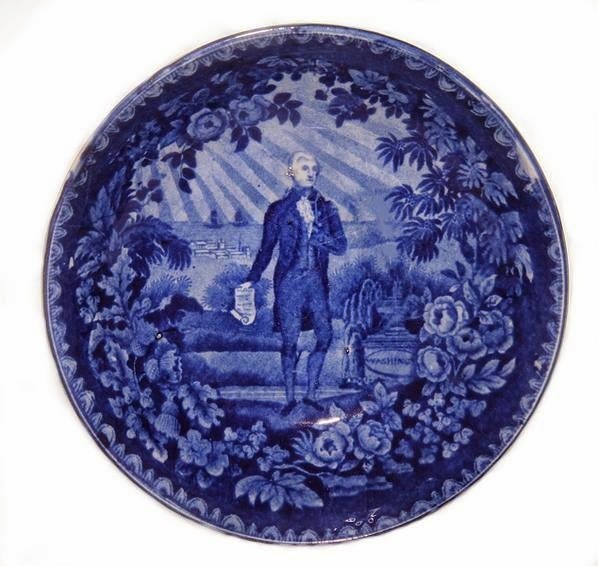 John Harrison (1781-1816) 9.75 inch plate Washington President plus the seal of the United States/An early transferware plate. 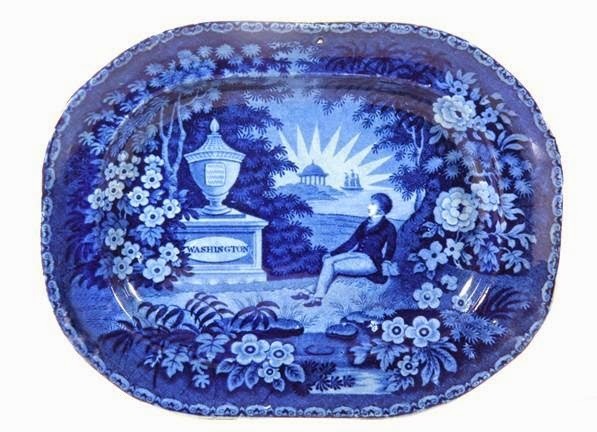 Enoch Wood & Sons (1818-1846) saucer, Washington Standing at His Tomb, Scroll in Hand/An allegorical pattern about which I haven't a clue! 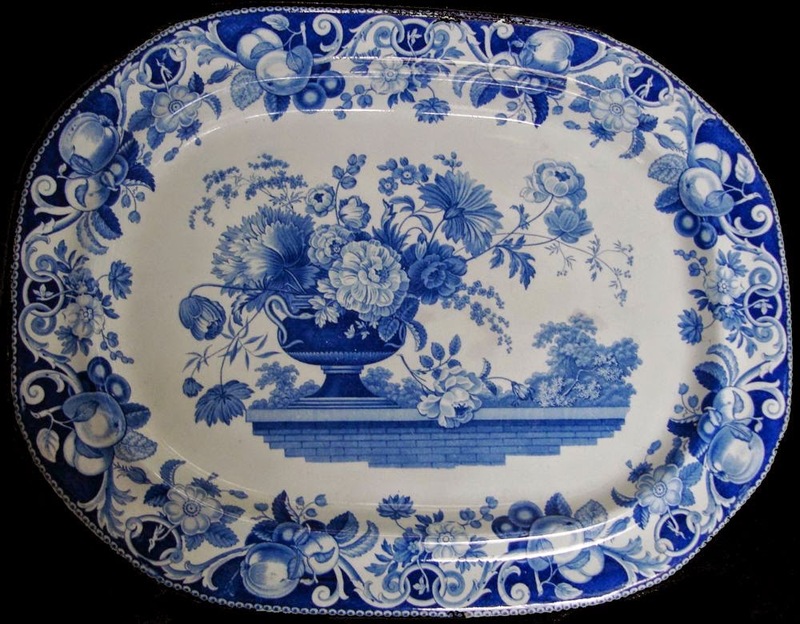 Enoch Wood & Sons (1818-1846) 6.5 inch plate La Fayette and Washington. 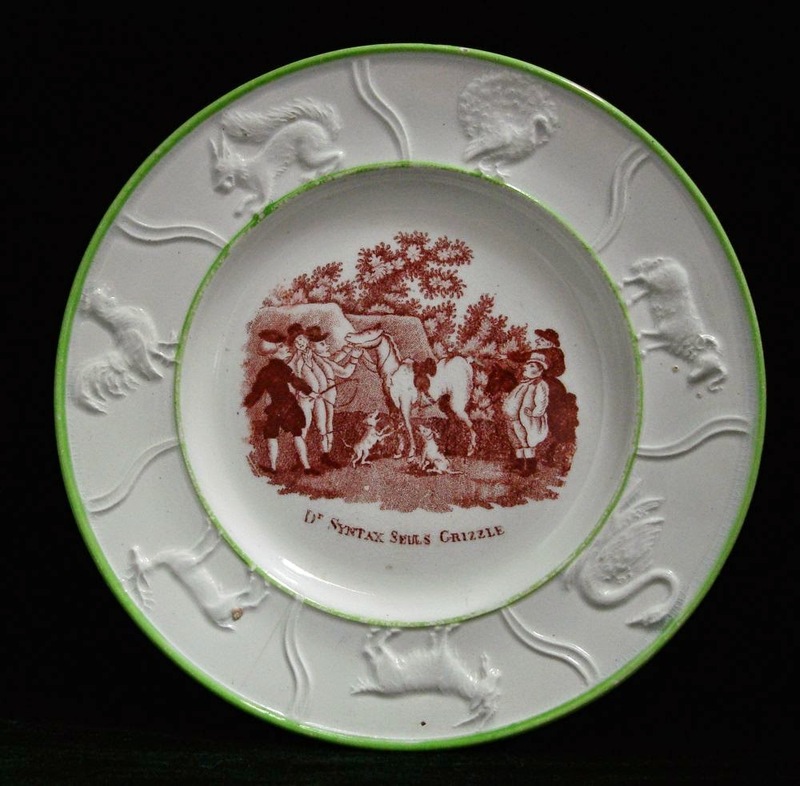 In 1824, La Fayette came to the United States to be honored as "Our Nations Guest." 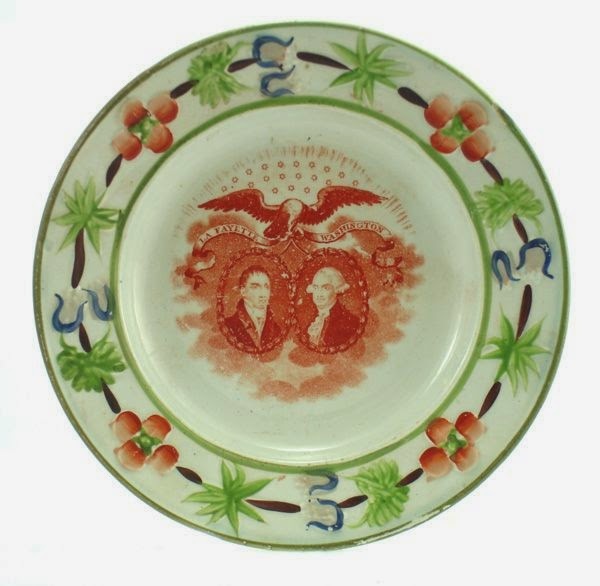 Below are two patterns that commemorated his visit. 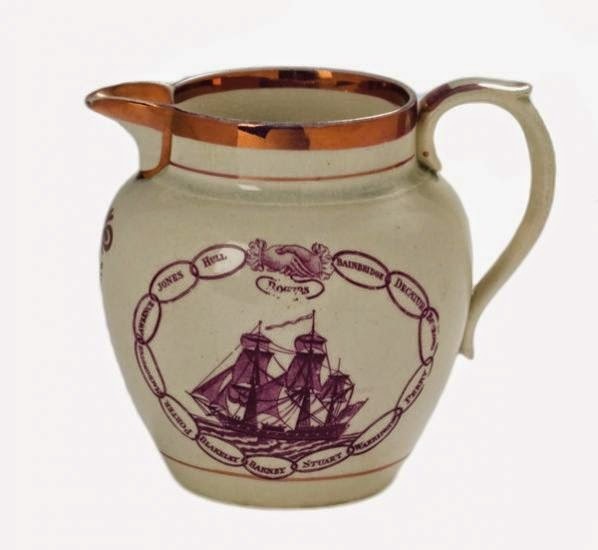 Some patterns commemorated the War of 1812. 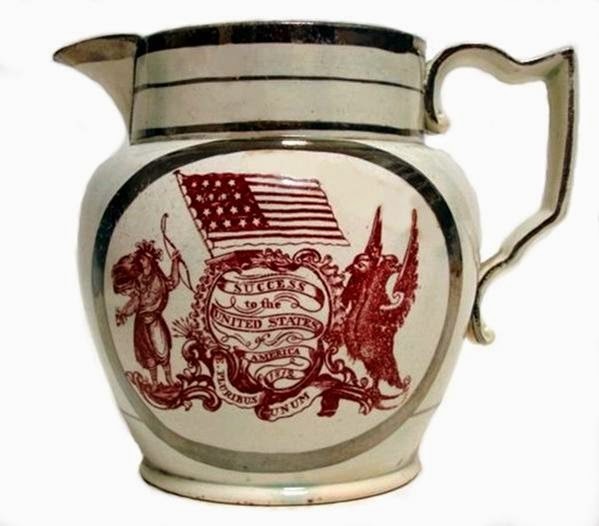 Pitcher, 6 inches by an unknown maker/Success to the United States of America 1812/Remember that the British lost this war, yet British factories made this commemorative jug for the American Market! 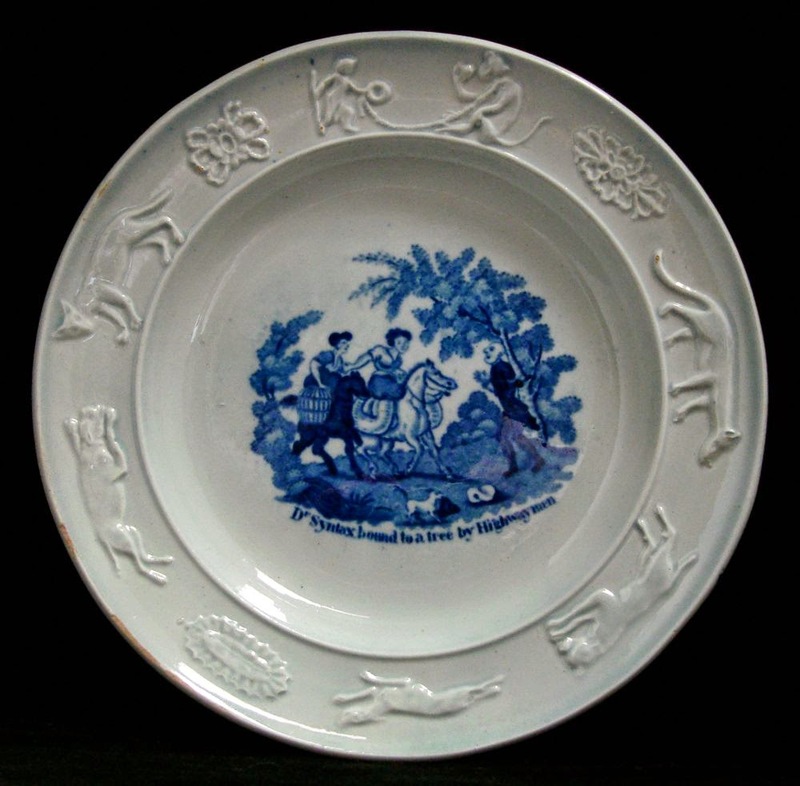 After the wars were won (or lost), it was "business as usual" in the British potteries. 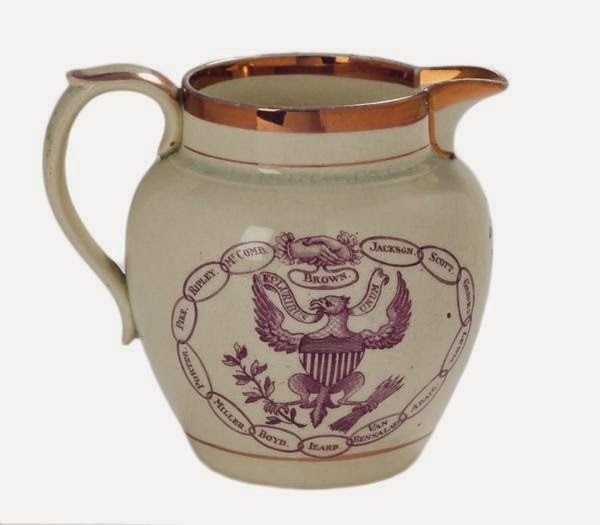 If you have enjoyed looking at these American historical patterns, take a look at Patriotic America, a website that features patterns that celebrate early America. 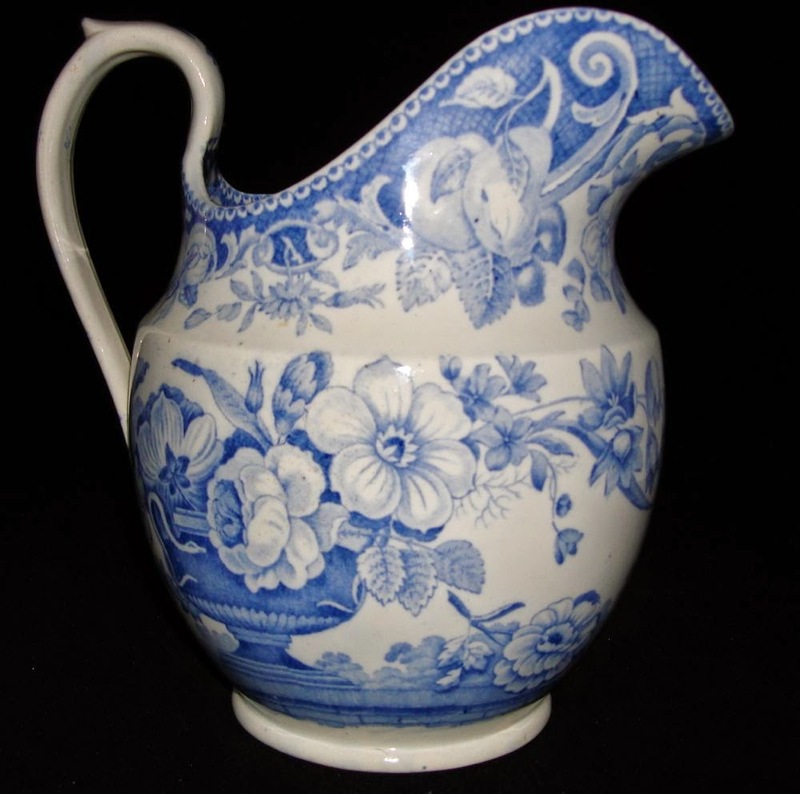 It was created by the Winterthur Museum, Historic New England and the Transferware Collectors Club.